Home > Who can access the internet? 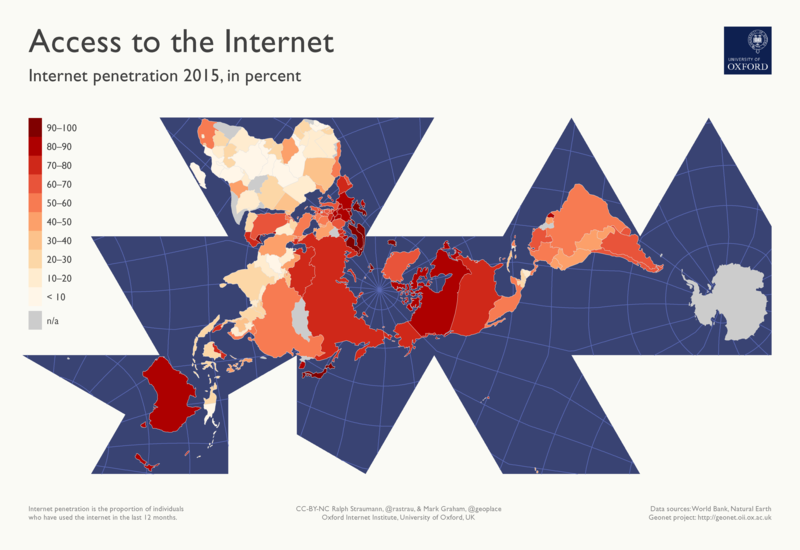 This map shows internet penetration, i.e. the percentage of the population of countries that has accessed the internet within a 12 month period, from any device (click for full size). It is an update of our earlier visualizations on this topic. Digital connectivity is often viewed as a vital resource for successful participation in the global knowledge economy. It is often presented almost as a panacea that would allow countries in the periphery of global economic activity to leapfrog to higher levels of economic development. Intertwined with these beliefs is the hope for democratization of information and knowledge production. Sadly, we find again and again that the old patterns of content creation do persist also in our digital age. Recently, by examining the geography of coding activity on GitHub and that of internet domain registration, we could show that these digital avenues of content creation are even more spatially uneven than the traditional ones (operationalized using academic articles). Thus, while access to the internet is a crucial enabler of digital content creation, it is important to bear in mind that policies and their outcomes (along with increasing connectivity) are important factors, namely: wealth, innovation capacity, and public spending on education. In view of this, what does the data show? The map paints a clear picture about access to the internet. We can identify a few key findings: Internet penetration is highest in the world’s economic cores: Europe, North America, as well as parts of Asia and Oceania. Here, often more than 90% of a country’s population have accessed the internet in some way. Internet penetration is lowest in Africa (especially Sub-Saharan Africa) and in parts of Asia. The map uses data on internet usage in 2015 that was obtained from the World Bank. The World Bank has tracked the number of internet users per country since the 1990s as part of its Worldwide Development Indicators project. The data is visualized using geodata from Natural Earth. Note: This post was originally published on the OII's Geonet project blog on 25 June 2017 3:21 pm . It might have been updated since then in its original location. The post gives the views of the author(s), and not necessarily the position of the Oxford Internet Institute.